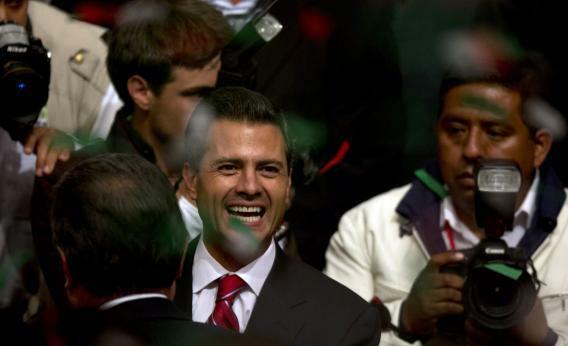 The Mexican presidential candidate for the Institutional Revolutionary Party, Enrique Peña Nieto, smiles after learning the first official results of the presidential election in Mexico City on Sunday. Peña Nieto won the election, according to first official results. First off: Everybody join me in thanking Matthew Taylor, a young and hard-working reporter who put in yeoman effort to keep this blog active in June. Thanks, too, to Sasha Issenberg, Jeremy Stahl, and Krystal Bonner for their posts. I was worried that my fresca hiatus (Slate’s mandatory/very fun month per year where reporters leave their beats for special projects) would leave this blog in a coma. Quite the opposite. I really appreciated the guest-bloggers’ hustle and great writing. The PRI returns to power in Mexico, banishing the conservative PAN to third place. A “quick count” based on a sampling of returns from across the country, announced by election officials late Sunday night, showed Mr. Peña Nieto with 38 to 39 percent of the vote and a 7-point lead over Andrés Manuel López Obrador, a former Mexico City mayor who lost narrowly in 2006 and is a member of the left-leaning Party of the Democratic Revolution. The conservative candidate, Josefina Vázquez Mota, a former cabinet secretary who sought to become Mexico’s first woman president, was running third with 25 to 26 percent. If you add in votes for the New Alliance, that’s around three-quarters of the vote for the left and center-left. The PAN, at its greatest strength in 2000, had only been able to win 43 percent of the vote, and here we see the effect of war with drug traffickers and lower-than-expected economic growth. Jan Crawford uses a stunning Supreme Court leak to dramatic effect, explaining what happened after John Roberts decided against striking down PPACA. Roberts … withstood a month-long, desperate campaign to bring him back to his original position, the sources said. Ironically, Justice Anthony Kennedy—believed by many conservatives to be the justice most likely to defect and vote for the law—led the effort to try to bring Roberts back to the fold. My colleague Dahlia Lithwick will have more on this.